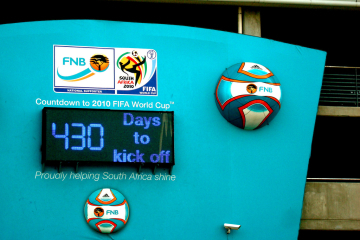 At Matador Sports, we’re counting down the hours until the 2010 World Cup kicks off. The games don’t start for another week, but people have been talking for months about which players won’t be there, whether playing conditions are ideal and, of course, who will win. At Matador Sports, we aren’t all soccer fans, but we’re learning to become them. Talk of the World Cup has been going on behind the scenes for months and has included everything from ethical debates to checking out the players when they bare it all (well, most of it). World Cup Preview: South Africa – Everything you wanted to know about South Africa, host of the 2010 World Cup. World Cup Team Profile: United States – Soccer may not be an American pastime, but does the US team have a chance of winning? Could the World Cup Cause a Food Shortage? – Will local farmers be able to handle the influx of people? 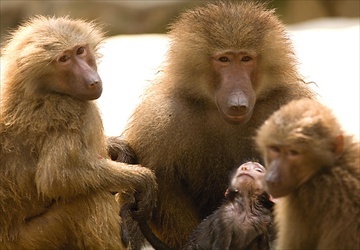 Brazen Baboons Cause Problems for the 2010 World Cup – A food shortage isn’t the only concern for South Africa. Notes on Missing the World Cup – Though David Beckham wasn’t scheduled to play for the US team, will his absence keep Americans from watching? Why a Netherlands World Cup Win Could Help US Soccer – Watching the Dutch play, American style. What on Earth is a Vuvuzela? – Expect noisy games with these mass-produced plastic horns. 2010 World Cup Could Set New Social Media Records – Twitter, Facebook and YouTube will give people around the globe second-to-second updates on the games. World Cup May Not Air in North Korea – Not everyone in the world will be tuned in. World Cup Preview: North Korea vs South Korea – The first time the two Korean nations will compete in the same World Cup. It could be an interesting showdown. Friday Fun: Nike’s Epic World Cup Commercial – If you haven’t seen this yet, check it out. World Cup 2010: The African Teams – This is the first time the World Cup will be played on African soil. Which of the continent’s teams stand a chance? Could Spain Win the 2010 World Cup? [Poll] – The Spanish team has good odds going in, but can they pull off a win? There’s still time to vote! World Cup Studs Strip Down to Their Skivvies – If you aren’t totally stoked for the World Cup yet, this should do the job. Will you tune into the World Cup? What team or issue is on your mind?